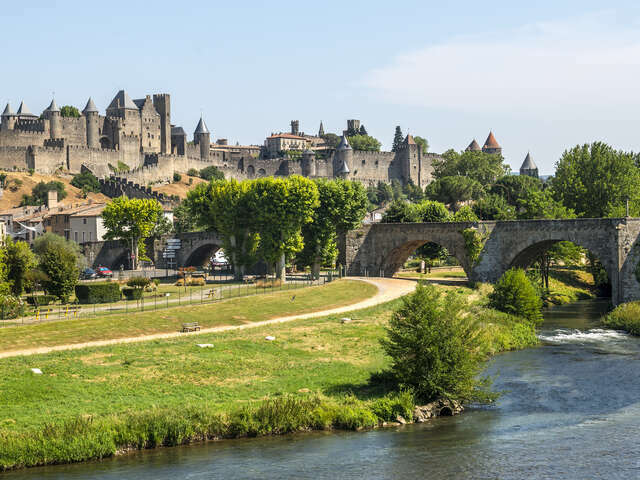 Carcassonne is a fortified French town in the Audedepartment, of which it is the prefecture, in the Region of Languedoc-Roussillon. Occupied since the Neolithic period, Carcassonne is located in the Aude plain between two great axes of circulation linking the Atlantic to the Mediterranean sea and the Massif Central to the Pyrénées. Its strategic importance was quickly recognized by the Romans who occupied its hilltop until the demise of the Western Roman Empire and was later taken over in the fifth century by the Visigoths who founded the city. Also thriving as a trading post due to its location, it saw many rulers who successively built up its fortifications, until its military significance was greatly reduced by the Treaty of the Pyrenees in 1659.